Patel Conservatory: From the Blog: Be a star this holiday season, donate an item on our Wish Tree! Be a star this holiday season, donate an item on our Wish Tree! The Patel Conservatory holiday Wish Tree is back! Last year, ballet student Amanda Greenway contributed to our Scholarship Stars because she wanted to help others enjoy the same opportunities she's had at the Patel Conservatory. This holiday season, you, too, can be a star by choosing an item to give from the Patel Conservatory's Wish Tree in TECO Lobby. From dry erase markers and DVDs to our Scholarship Stars, the Conservatory’s wish list items directly benefit our students in our classrooms. Help a student’s dreams come true by contributing to our Scholarship Stars! Every gift, no matter the amount, helps provide scholarships to our students, keeping arts education available for all. When you contribute an item on our Wish Tree, we’ll put your name, or your student’s name, on the tree! 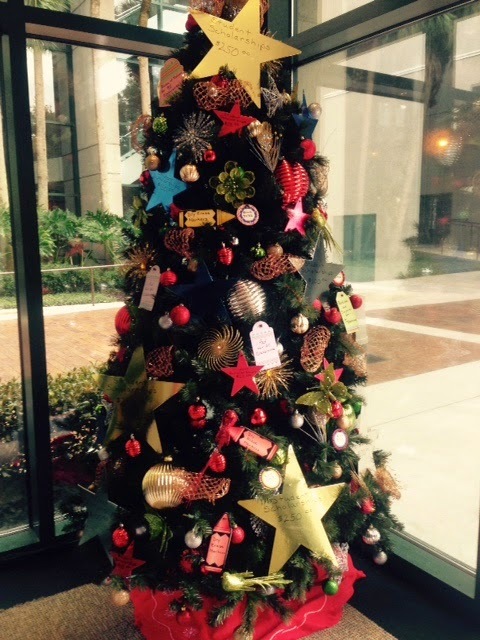 Simply choose an item on our Wish Tree in TECO Lobby, then give your gift to the registrar in the Chairmen’s Library by Sat., Dec. 20, 2014. For questions or more information, contact us at 813.222.1002 or patelconservatory@strazcenter.org.